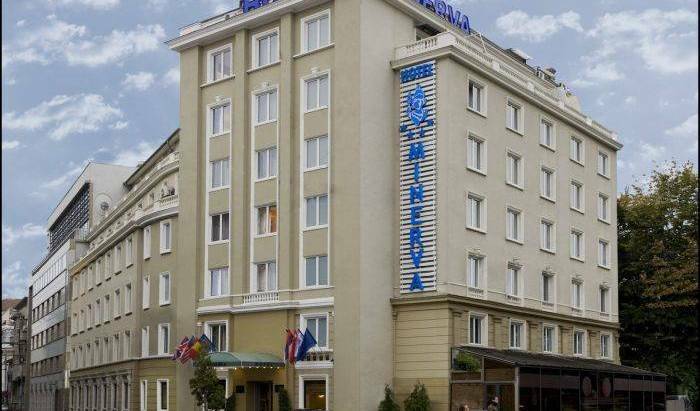 AVIS Baneasa Hotel is your perfect choice, either you want to visit Bucharest, Either you are in town for a business meeting or you are just tourist. 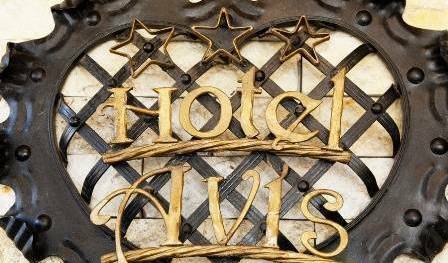 Located next to Baneasa International Airport, Avis Hotel is a convenient choice for leisure and business travelers. 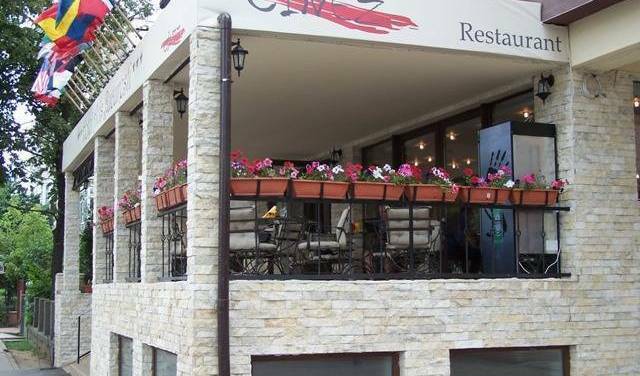 The perfect destination for a dream vacation or business meeting on the shores of the famous Lake Snagov. 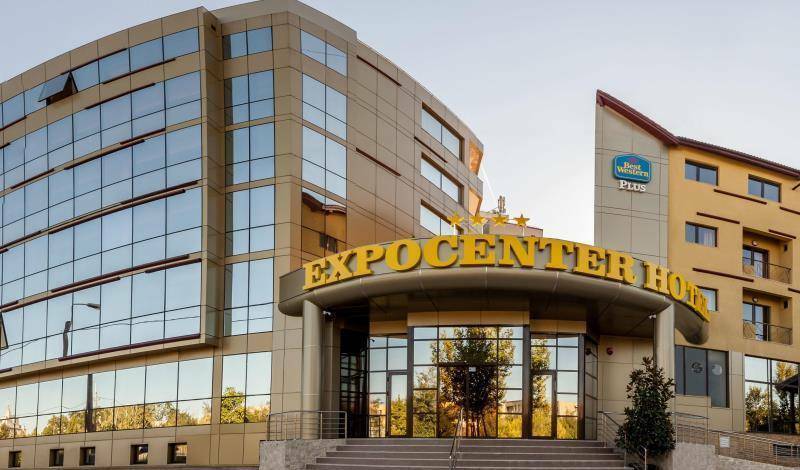 BEST WESTERN PLUS Expocenter Hotel**** is part of the biggest hotel chain in the world with more than 4000 hotels in over 100 countries. Addressing both business and leisure segments we offer hospitality and luxury by standards of excellence. Located in the central area of Bucharest, this villa provides the levels of comfort and functionality you are looking for. 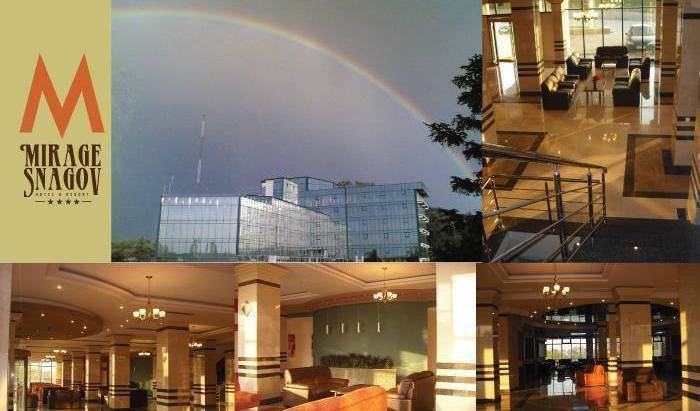 Capital Plaza Hotel is located in the heart of Bucharest, between Victoria Square and the vibrant Dorobanti area. Size of 17 sqm; Safety deposit box; Laundry service; Air Conditioning and thermostat; Windows that open; Electronic key card system; Modern furniture; King size bed or twin beds. Room facilities:Refreshments/Food: Coffee/Tea making facilities; Mini Bar; 24 h Room Service; Data services: High-speed Internet Access; Wireless Internet; Workspace: Work Desk; Phone: Direct Dial Phone; Bathroom/Personal care: Bathroom with shower; Bathrobe and slippers; Cosmetics; Hairdryer; Phone. Size 20 sqm; Safety deposit box; Laundry service; Air Conditioning and thermostat; Windows that open; Electronic key card system; Modern furniture; King size bed or twin beds; View of the Iancu de Hunedoara Boulevard. Room facilities: Refreshments/Food: Coffee/Tea making facilities; Mini Bar; 24 h Room Service ; Data services: High-speed Internet Access; Wireless Internet; Workspace: Work Desk; Phone: Direct Dial Phone; Bathroom/Personal care: Bathroom with shower; Bathrobe and slippers; Cosmetics; Hairdryer; Phone; Cosmetic mirror; Special cosmetics. Size of 30 sqm; Safety deposit box; Laundry service; Air Conditioning and thermostat; Windows that open; Electronic key card system; Modern furniture, sofa, armchairs; King size bed; Connecting room option; Welcome treatment. Room facilities: Refreshments/Food: Coffee/Tea making facilities; Mini Bar; 24 h Room Service; Data services: High-speed Internet Access; Wireless Internet; Workspace: Work Desk; Phone: Direct Dial Phone; Bathroom/Personal care: Bathroom with bathtub and bidet; Bathrobe and slippers; Scale; Cosmetics; Hairdryer; Phone; Cosmetic mirror; Special cosmetics. Size of 34 sqm; Living room and bedroom, TV in both rooms; Safety deposit box; Laundry service; Air Conditioning and thermostat; Windows that open; Electronic key card system; Modern furniture, sofa, armchairs; King size bed, Welcome treatment; Free international newspaper delivered to room; Free parking. Room facilities: Refreshments/Food: Coffee/Tea making facilities; Mini Bar; 24 h Room Service; Data services: High-speed Internet Access; Wireless Internet; Workspace: Work Desk; DVD player; Phone: Direct Dial Phone; Bathroom/Personal care: Bathroom with shower; Bathrobe and slippers; Scale; Cosmetics; Hairdryer; Phone; Cosmetic mirror; Special cosmetics. Dalin Center Hotel was built in 2008 in the centre of Bucharest and it is situated on the main boulevard Stefan Cel Mare. A new clean and cheep hostel, situated in the middle of Romania`s capital Bucharest. All the rooms have bathrooms, color satelite TV, and free internet acces and free tee and coffee. We offer both to the business and tourist clients a wide array of services. We encourage anyone over 18 to do this ! You can get to know Bucharest, and not just to pass through. You may love it, or not so much, its different from most of the places you've been to, its similar to some, but you be the judge. Welcome to RomPromo Plus Accommodation / apartments4rent ro in the AMZEI historic center of Bucharest downtown, an exceptional and prestigious place at some minutes walk away of all Bucharest’s day and night attractions! Bucharest downtown, AMZEI historic center, Mendeleev street from the name of the famous russian chemist Dimitri Mendeleev, between the Romana, Revolution squares, Calea Victoriei and Magheru blvd, restaurants , night-clubs, casinos, 24/7 supermarket at the corner of the building on Amzei square, you find there many important universities (Architecture, Economy…), banks, museums like the National Art museum, or the interesting History museum, embassies (UK, France, Italy, Canada, Spain, Bulgaria, Cuba), churches of various faiths (orthodox, catholic, synagogue, anglican), the most important theaters (National theater, Nottara theater…), the 2 main concerts halls, Ateneul Roman for the classical music, Sala Palatului for the light where performed international stars like Sting, Patricia Kaas, Demis Roussos,.... Romana square subway station, bus, cabs, the new Amzei market hall, Icons garden at 100m, Cismigiu gardens and its lake where you can rent small rowboats, everything close to you....: This is the living but quiet vicinity of the self catering studio apartment AMZEI for a short term rental, for Your most pleasant stay! This *** apartment UP TO 3 PERSONS is the right and comfortable place on a budget for your next accommodation in the heart of the entertainment and business center. 5th floor, 26sqm, recently refurbished, furnished, very quiet (courtyard, no street side!). * KITCHEN / DINING AREA with: Washing machine, gas stove, gas oven, refrigerator, coffee maker, Italian coffee maker Espresso, microwave, electric kettle, toaster, Complete kitchen ustensils, Ceiling fan, parquet. * BEDROOM: . LCD 10, 4in with Hotbird digital satellit channels, . Radio / Alarm, . Double bed (140x200cm/55x79in) with orthopedic mattress, . Ceiling fan and soon, air conditioning system with remote control, . Wall paper, . Carpeted floor. * BATHROOM : shower, window overlooking outside, electric air extractor. * GENERAL: Building with video monitoring system, Security entry door, Terrace, Aluminum radiators, Gas independent central heating with thermostat on each radiator, Thermal double glazing windows, Presence sensor for the light of the entry (terrace), Iron and iron board supplied, Bedsheets and towels supplied and changed weekly. Kid: apply to us. Options: Washing machine: FREE for 7 nights minimum stay, for shorter term rentals €10 flat rate, Wireless broadband : FREE for 7 nights minimum stay, for shorter term rentals €3/day, Comfortable extra air bed 99cm(39in) x 191cm(77in) 136kg (300lbs) maxi. Between the Romana and Revolution squares, in a very quiet area aside the French embassy, in the heart of the cultural life of Bucharest with the National theatre, Art Galleries, the National Art Museum in the former Royal Palace, the History Museum, at 5min walking from the 2 main concerts halls, Ateneul Roman for the classical music, Sala Palatului for international events and light performances, from the Amzei historic and Lipscani old centers, from the amazing Cismigiu Gardens and their lake ... Here are the surroundings of your next stay in Bucharest downtown for a short term rental. This *** apartment can accommodate UP TO 3 PERS. but, situated on the same floor beside 2 ROOMS FRENCH EMBASSY, together they are a place of choice up to 6-7 GUESTS. 5th floor, 28m2, recently refurbished. * LIVING ROOM / BEDROOM : . Double Bed with ORTHOPEDIC mattress 140 x 200cm / 55 x 79in . LCD 27in 16/9 with +50 cable channels. * KITCHEN equipped with : . Microwave, . Fridge freezer, . Gas stove, . Italian coffee maker Espresso... * BATHROOM : . Shower, . Washing machine, . Clothes drye, . Window on the outside. * GENERAL: . Air conditioning system with remote control, . Gas independent central heating, . Thermal double glazing windows, . Secure front door, . Top quality Sheets and Towels are supplied and changed weekly. . WiFi Broadband: FREE. OPTION: * Extra air bed 100 x 190cm / 40 x 75in. Bucharest downtown, Magheru the main blvd, the heart of the center, along the Nottara theater, restaurants, night-clubs, casinos (see ''Quid'' menu, sub menu ''Entertainment''), 24/7 supermarket, important universities (Architecture, Economy…), banks, museums (National Art museum, History museum…) embassies (British, France, Italy, Canada, Spain, Bulgaria, Cuba...), churches (Orthodox, Catholic, Anglican, Synagogue), the most important theaters (National, Nottara …), the 2 main concerts halls, Ateneul Roman for the classical performances, Sala Palatului (3200 seats) for the international pop stars, Romana square subway station, cabs, bus, Amzei market hall at 100 yards, Icons garden and Cismigiu gardens with its small rowboats on the lake.... This is the brilliant background of the self catering apartment studio MAGHERU for a short term rental, for Your very next stay...! This **** luxury apartment (32sqm), at the 1rst floor, newly refurbished, is a location of reference, a prestigious address designed for UP TO 3 PEOPLE, along all of Bucharest’s day night attractions and of the business centers (banks, ministries, embassies,...). * LIVING ROOM (22sqm) furnished with: . Electronic safe in the wall with your own code, . Air conditioning system with remote control, . Queen bed IN the large WARDROBE (160cm/63in with orthopedic mattress) : .......... Closed (Up) you have a spacious living room or office, .......... Opened (Down) you get a large bedroom. .......... Finally you get a ONE BEDROOM APARTMENT. . A very comfortable extra air bed, 100cm(39i) 191cm(75i) 47cm(18, 5i) 136kg (300lbs) maxi can be installed for a 3rd guest. . Carpeted floor, . Sound proofing, . HD LCD 106cm/42in with 103 channels by fiber optic, . DVD, . Stereo Radio-Triple CD-Double Cassette player, . Work desk, * OPEN KITCHEN-BAR fully equipped with: Ignition gas stove, microwave oven, electric juice squeezer, electric coffee maker, Italian coffee maker Espresso, toaster, incorporated fridge, automatic electric air extractor, hood with external evacuation, washing machine, Complete kitchen ustensils. * BATHROOM : Aluminum false ceiling, shower with sandstone tray, washbasin with special battery with shower and hose of 2m to replace a bidet, hair dryer, automatic electric ventilation, balance, wall dryer for clothing. * GENERAL: Building with Video monitoring system, 2 elevators and intercom, Secure parking and supermarket in front of the apartment, Thermal and acoustic triple glazing window, General electric light interrupter on the right side at the exit of the flat, Fully grounded new electric installation, Electric wood roller-blind, Electric water heater (80L) in case of problem with the main system, Security entry door of the apartment, Vacuum cleaner, Iron and iron board supplied, Bedsheets and towels supplied and changed weekly, Washing machine FREE from a 4 nights stay, 1-3 nights €10 package, Wireless Broadband: FREE. * Since 2003, it is our main target to provide for all our clients needs and to perform this service in a professional manner and in a mutual respect. Bucharest downtown, AMZEI historic center, Biserica Amzei street aside the French Embassy and between the Romana and Revolution squares, restaurants, night-clubs, casinos, a 24h/7 supermarket, many important universities (Architecture, ASE), banks, museums (National Art museum, History museum…), embassies (UK, France, Italy, Canada, Spain, Bulgaria, Cuba …), churches (orthodox, catholic, synagogue, anglican), the most important theatres, National theatre, Nottara theatre, the 2 main concerts halls, Ateneul Roman for the classical music, Sala Palatului for the international light music performances, Romana square subway station, bus, cabs, Amzei market, all within 100yards, Icons garden, Cismigiu gardens where you can enjoy the lake and its rowboats. Everything you have absolutely everything close to you. Here are the surroundings of the AMZEI 2 rooms self catering apartment for a short term rental. This **** one bedroom apartment is a place of choice up to 4 PERSONS 5th floor, 40sqm, view on the ROMANA square surroundings, very quiet (court, no street side), newly refurbished : * LIVING ROOM : . Double sofa bed (140x190cm/55x75in) * BEDROOM : . KING size bed (180x200cm/71x79in) with ORTHOPEDIC MEMORY foam mattresses . LED TV 32in/81cm FULL HD 1920/1080dpi with digital satellit (52 channels) . Stereo Radio-CD-MP3 player with remote control . Electric external roller-blind . Aluminum radiators. * OPEN KITCHEN fully equipped : Vitro-ceramic hobs, refrigerator, microwave oven, electric coffee maker, Italian coffee maker Espresso, electric kettle, toaster, hood with external evacuation, Complete kitchen ustensils, Washing machine. * BATHROOM : Large bathtub with shower attachment, electric air extractor. * GENERAL : Video monitoring system in the building and in its court of access, Intercom, Air conditioning system with remote control, Gas independent central heating with thermostat on each radiator, Electric water heater (80L) in case of problem with the main system, Thermal double glazing windows, General light interrupter on the right side at the exit of the flat, Fully grounded new electric installation, Security entry door, Vacuum cleaner, Iron and iron board, Bedsheets and towels supplied and changed weekly, Washing machine FREE from a 4 nights stay, 1-3 nights €10 package, WiFi Broadband: FREE. * Don't forget, this is your home away from home in Bucharest! **** Apartment: * LIVING ROOM : . Double sofa bed (140x190cm/55x75in) * BEDROOM : . KING size bed (180x200cm/71x79in) with ORTHOPEDIC MEMORY foam mattresses . LED TV 32in/81cm FULL HD 1920/1080dpi with digital satellit (52 channels) . Stereo Radio-CD-MP3 player with remote control . Electric external roller-blind . Aluminum radiators. * OPEN KITCHEN fully equipped : Vitro-ceramic hobs, refrigerator, microwave oven, electric coffee maker, Italian coffee maker Espresso, electric kettle, toaster, hood with external evacuation, Complete kitchen ustensils, Washing machine. * BATHROOM : Large bathtub with shower attachment, electric air extractor. * GENERAL : Video monitoring system in the building and in its court of access, Intercom, Air conditioning system with remote control, Gas independent central heating with thermostat on each radiator, Electric water heater (80L) in case of problem with the main system, Thermal double glazing windows, General light interrupter on the right side at the exit of the flat, Fully grounded new electric installation, Security entry door, Vacuum cleaner, Iron and iron board, Bedsheets and towels supplied and changed weekly, Washing machine FREE from a 4 nights stay, 1-3 nights €10 package, WiFi Broadband: FREE. We are here (24h daily, centrally located, 5 minutes walking from Gara de Nord, in a nice old house), happy to guide you (with free maps and best tips) to discover the Bucharest and Romania of the local people at the best rates for you. Spacious room with private bathroom situated at the 4th floor with an amazing panoramic view of the city. LCD tv and free WI-FI connection. Spacious rooms with king-size beds and private bathrooms and with an excelente city-view and LCD tv and free WI-FI connection. A very large king-size room with a matrimonial bed and 2-floor beds for children. It is a sun rise room with private bathroom and LCD tv and free WI-FI connection. Located in Bucharest downtown, in a quiet, nice area. We have 8 rooms/26 beds, recreation room, kitchen, garden terrace, laundry, bike parking. We own a 3 star hotel in the center of Bucharest and we will be glad to have the opportunity to promote it on your website. Junior Suite apartment has about 45 Sq2, and it's divided into a bedroom with private bathroom and a living room with chicken. Our Family Apartments are generous in size and they have in addition to kitchen and living room, 2 bedrooms with Queen size beds and 2 bathrooms. Located in one of the most beautiful areas of Bucharest North, near the lake Floreasca, Johann Strauss 3 Star Hotel is the ideal place for business and cultural tourism. Our dorm rooms are safe and comfortable. The beds and linen are all new and luxurious. We have several six-bed dorms. Our dorm rooms are safe and comfortable. The beds and linen are all new and luxurious. We have several seven-bed dorms. 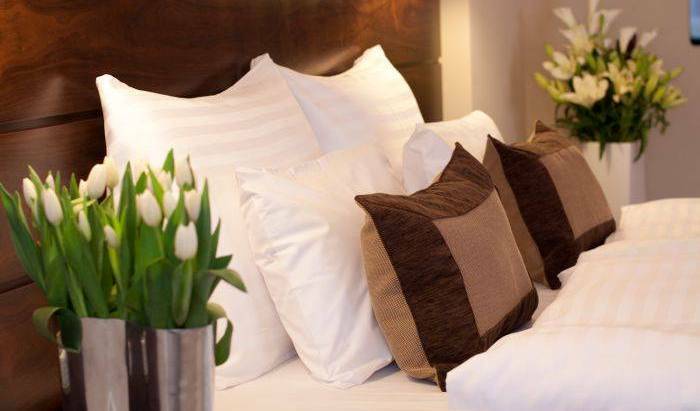 Our private rooms are perfectly clean and comfortable. There are conveniently placed shared showers and toilets. The height of luxury and personal comfort! Our premium double ensuites are bright and comfortable, with the added bonus of your own ensuite bathroom and personal shower. Our Hostel is perfect for those seeking a unique experience in Hostel accommodation. 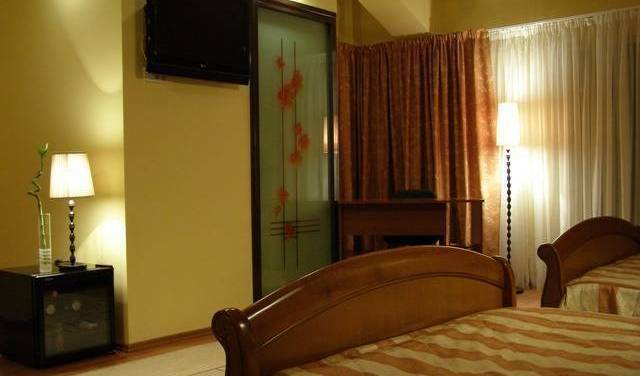 Double or Twin room with private bath with garden view. 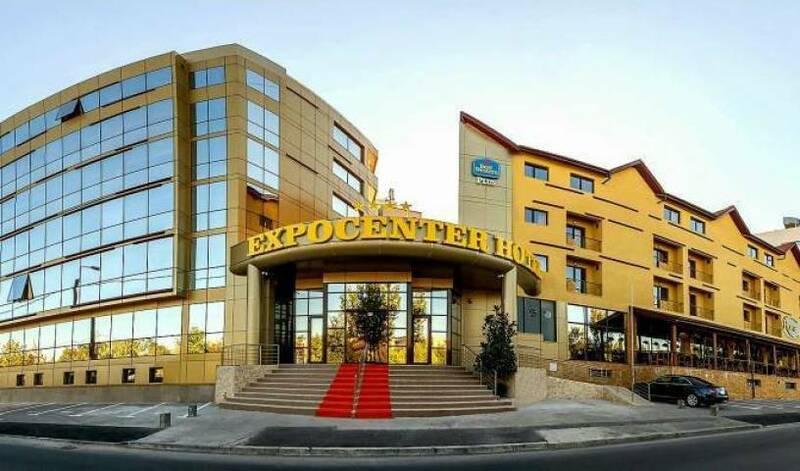 Situated in Bucharest’s heart, in vicinity of Unirii Squaire, Universitatii Squaire and Hyperion University, in Traian Market zone (10, Hagiului Str., crossroads 136 Calarasilor Ave.,) Tripoli Hotel offers you rooms at an attractive cost!!! ApartHomes offers you gorgeous places to stay, luxuriously furnished apartments for short and long term. Classified at four stars by the Ministry of Tourism, you can choose from a selection of studios, one, two and three bedroom apartments. A selection of 4 studios, located in Dorobanti area down by Mario Plaza Shopping Gallery and Baneasa Area, across Herastrau Park, renovated, new furniture and appliances with a mixture of warm colours, nice, sunny room, bathroom with bath tub / shower cabin, fully equipped kitchen, parquetry, Italian tiles, safe building and quiet area, very close to nearby supermarkets, market, coffee bars and restaurants. In these units there is a double bed and an extra bed can be provided. A selection of 9 apartaments, with 2 rooms each (living room and bedroom), located in Dorobanti area, Herastrau - across the Park, Romana Square – near McDonald’s, Victoriei Square – near the Government Building, renovated, new furniture and appliances with a mixture of warm colours, nice, sunny room, bathroom with bath tub / shower cabin, fully equipped kitchen, parquetry, Italian tiles, safe building and quiet area, very close to nearby supermarkets, market, coffee bars and restaurants. In these units there is a double bed and an extensible sofa; there is the possibility to bring an extra bed. selection of 8 apartaments, with 3 rooms each (living room and 2 bedrooms), located in Dorobanti area, Romana Square – near McDonald’s, Victoriei Square – near the Government Building or Unirii – right in the Square, renovated, new furniture and appliances with a mixture of warm colours, nice, sunny room, 2 bathrooms with bath tub and shower cabin, fully equipped kitchen, parquetry, Italian tiles, safe building and quiet area, very close to nearby supermarkets, market, coffee bars and restaurants. In these units there are two double beds and an extensible sofa; there is the possibility to bring an extra bed. A selection of 2 apartaments, with 4 rooms each (living room and 3 bedrooms), located in Romana Square – near McDonald’s or Herastrau – just across Herastrau Park, renovated, new furniture and appliances with a mixture of warm colors, nice, sunny room, 2 bathrooms with bath tub and shower cabin, fully equipped kitchen, parquetry, Italian tiles, safe building and quiet area, very close to nearby supermarkets, market, coffee bars and restaurants. In these units there are double bed and two extensible sofas; there is the possibility to bring an extra bed. BellaDonna Hotel in Chisinau, Moldova , a luxury hotel in the center of Chisinau, with cheap accomodation. Praised to be the most luxurious hotel in the country, this is the only hotel in Romania ever included in the prestigious Conde Nast Traveler Top 136 Best Hotels of the World! Located right in the center of Bucharest our hostel is a pleasant, clean and friendly house waiting for you. Only few minutes walking distance from all public transportation we offer two single rooms and four sharing rooms - with six or eight beds. 1 double bed. 1 TV. WiFi. Shared bathroom, shared fridge, shared washing-machine. Approx 14 sqm. 1 large room ( 33 sqm ). 1 double bed, 1 simple bed. 1 TV. WiFi. Shared bathroom, shared fridge, shared washing-machine. 1 single bed. 1 TV. WiFi. Shared bathroom, shared fridge, shared washing-machine. Approx 14 sqm. Near to Bucharest city VillaVerde expects you in cozy rooms with a terrace in front of a house and pretty much in the backyard where it is arranged for the barbeque grill, with a lovely flower garden. 5-star pampering, a stone’s throw from Bucharest!